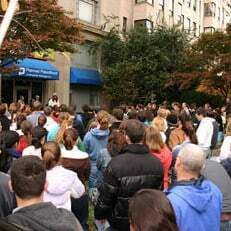 Christendom College’s student-run pro-life group, Shield of Roses, will be travelling to Washington, DC, on October 27 to pray in front of a Planned Parenthood clinic located at 1108 16th Street, NW. Over 250 students—65% of the student body—have signed up for what they call Mega Shield, an event held once a semester that aims to draw a larger number than the 20-30 students that normally participate. At this Saturday’s Mega Shield, students hope to attract a record number of prayerful protesters. 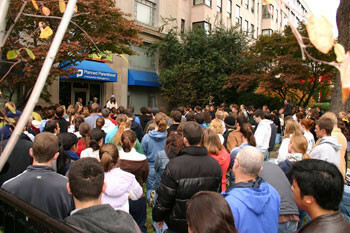 The largest group was seen in 2009 with around 200 students. This year, the group will leave campus after the 7:30 a.m. Mass, arrive in DC around 9:30 a.m., pray four rosaries, recite a Divine Mercy Chaplet, and sing hymns before leaving DC around noon. Anyone interested in participating in this pro-life prayer event are welcome to join the Christendom College students from 9:30 a.m. – noon at the Planned Parenthood abortion clinic.